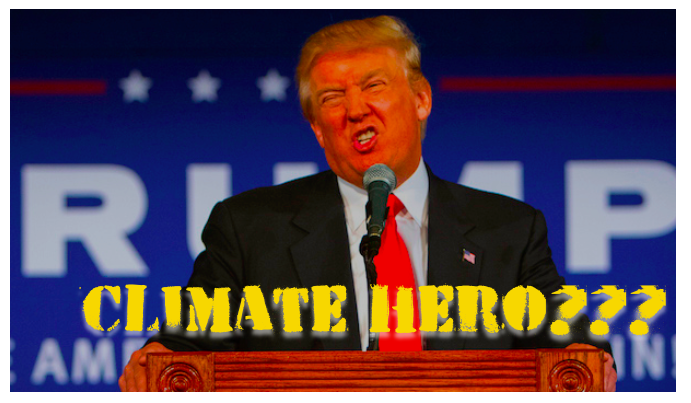 #95) Trump: Climate Hero of All Time? John Oliver last night suggested Trump might have inadvertently given the climate movement something they’ve needed from the start. I’m in total agreement. It’s easy to see if you look at it in ABT terms. Trump is the B of the ABT that “the climate narrative” has needed all along. This is why Al Gore’s boring “And, And, And” (AAA) movie was so sadly misguided. Narrative is everything. DON’T FEEL THE NEED TO THANK HIM, but as John Oliver suggests, he has done a favor for the climate movement with the strength and singularity of his contradiction of the entire topic. JOHN OLIVER: This week the climate movement may have gotten a symbol to rally around because apparently it was never quite enough to motivate ourselves out of love for this large gassy orb (EARTH photo), but maybe, just maybe we can now motivate ourselves to do something out of our loathing of THIS one (TRUMP photo). Here’s what John Oliver is saying. For twenty years all sorts of well meaning people have been boring the holy hell out of the masses with their AAA (“And, And, And”) documentaries and other do-gooder media efforts. Throughout my first book, “Don’t Be Such A Scientist,” I used Al Gore’s snoozefest, “An Inconvenient Truth,” as an example of poor communication. Six years later in “Houston, We Have A Narrative,” I went into even more detail about this using the ABT. Why was all that media so boring? Because it lacked narrative strength. How did it lack narrative strength? It lacked contradiction. How could it have had contradiction? By going after the climate skeptics, big time. Did Al Gore deal with the climate skeptics? Only in a weak and misguided way. He dismissed them right off the bat. In so doing he wasted his entire opportunity to create narrative strength. Gore dealt with climate skeptics with a single number. He presented the number of studies examined by Naomi Oreskes in her Science paper and posed the question of how many of them disagreed with the consensus on climate change. The answer was zero, meaning that in the real science world nobody buys into climate skepticism. And that was it. From there on he basically implied that climate skepticism was a trivial topic and never visited it again in the movie. Big mistake. That was his potentially powerful source of contradiction. Factually they might have been a trivial force, but narratively they presented a huge opportunity. That was wasted. But he didn’t take advantage of that because he and the filmmakers were so weak on narrative intuition. So is anyone in the climate movement FINALLY ready to accept that “ignore them and they will go away” is not a viable strategy for climate skeptics? It never was, any more than to ignore the Swift Boat Veterans ever was for John Kerry. I swear, the instincts of the left are just so bad when it comes to politics. Trump is now the grand manifestation of the skeptic perspective and that is a potentially good thing, as John Oliver implied. Yes, there will be some setbacks, but he is the singular source of contradiction that is now bringing the entire ABT of climate into focus. The climate crowd at least finally knows who and where the enemy is and how to combat them. Just look at some of the things happening. The fact that almost all of the major corporations are in support of the Paris Accord is now a huge story. There have been small articles over the past decade pointing out how both the military and major corporations have accepted climate change as a serious threat, but it’s only now that it’s suddenly a big story, thanks to Trump. John Oliver pointed out that Walmart, Bank of America and Phillip Morris all support the Paris Accord. The entire issue is now coming into very clear and simple focus, thanks to Trump. It could have happened a decade ago, but the people in charge are just too devoid of narrative intuition. And so now the world has assembled the narrative elements for them. The question is whether anyone in the movement will actually listen and learn anything. Or will they just revert to their AAA ways of the past decade.